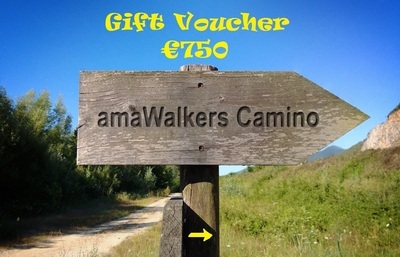 You can buy a special friend, family member or loved one a gift voucher to walk the Camino with one of our Spring or Autumn groups. Payment can be made via our secure pay merchant. Recipients of the vouchers will have to send us a Contact Form, or contact us by email, to secure a place in their chosen group. Places are only guaranteed once they have completed a Registration and Indemnity Form. Normal Booking Conditions and Cancellation fees will apply. Due to SPAM mail being sent from our contact form we have temporarily removed the form. Please click on the email icon at the top of the page to contact us.